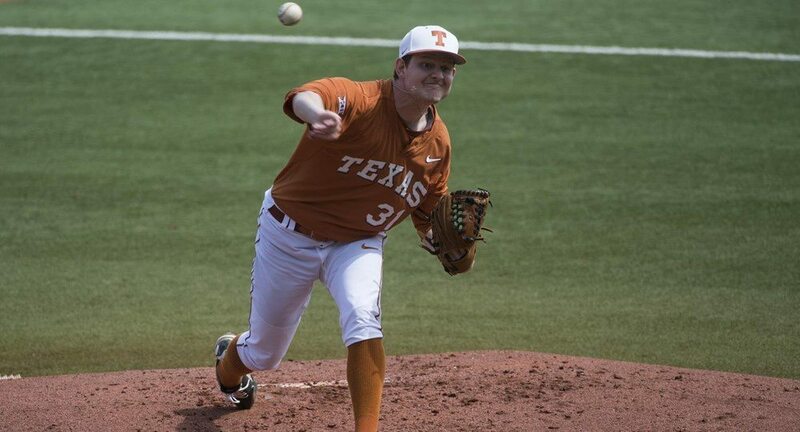 Chad Hollingsworth pitching against West Virginia (Photo: UT Athletics Photography). AUSTIN – Texas pitcher Chad Hollingsworth scattered five hits over seven innings despite being unable to locate his breaking pitch and Collin Shaw had two hits and two RBI as the 16th-ranked Longhorns pushed past West Virginia 5-1 on Sunday at UFCU Disch-Falk Field to win the rubber game of the two teams’ Big 12 opening series. It’s the first time since a three-game sweep at Oklahoma in 2012 that Texas has won a conference-opening series.